Railway network map with conventional lines upgraded or built to accommodate CRH shown in orange (160–250 km/h (99–155 mph)), secondary high-speed lines in green (200–299 km/h (124–186 mph)), and blue (above 300 km/h (190 mph)). By the end of 2018, HSR extended to 30 of the country's 33 provincial-level administrative divisions, the exceptions being Macau, Ningxia, and Tibet, and reached 29,000 km (18,000 mi) in total length, accounting for about two-thirds of the world's high-speed rail tracks in commercial service. The HSR building boom continues with the HSR network set to reach 38,000 km (24,000 mi) in 2025. Almost all HSR trains, track and service are owned and operated by the China Railway Corporation under the brand China Railway High-speed (CRH). The China Railway High-speed (CRH) high-speed train service was introduced in April 2007 featuring high-speed train sets called Hexie Hao (simplified Chinese: 和谐号; traditional Chinese: 和諧號; pinyin: Héxié Hào; literally: 'Harmony') and Fuxing Hao (simplified Chinese: 复兴号; traditional Chinese: 復興號; pinyin: Fùxīng Hào; literally: 'Rejuvenation') running at speed from 250 km/h to 350 km/h on upgraded/dedicated high-speed track. The Beijing-Tianjin intercity rail, which opened in August 2008 and could carry high-speed trains at 350 km/h (217 mph), was the first passenger dedicated HSR line. High-speed rail developed rapidly in China over the past 15 years with substantial funding from the Chinese government, especially the economic stimulus program during the Great Recession. The removal of Railway Minister Liu Zhijun for corruption and a fatal high-speed railway accident near Wenzhou in 2011 raised concerns about safety as well as affordability, financial sustainability and environmental impact. China's early high-speed trains were imported or built under technology transfer agreements with foreign train-makers including Alstom, Siemens, Bombardier and Kawasaki Heavy Industries. Since the initial technological support, Chinese engineers have re-designed internal train components and built indigenous trains manufactured by the state-owned CRRC Corporation. The advent of high-speed rail in China has greatly reduced travel time and has transformed Chinese society and economy. A World Bank study found "a broad range of travelers of different income levels choose HSR for its comfort, convenience, safety and punctuality." Notable HSR lines in China include the Beijing–Guangzhou high-speed railway which at 2,298 km (1,428 mi) is the world's longest HSR line in operation, the Beijing–Shanghai high-speed railway with the world's fastest operating conventional train services and the Shanghai Maglev, the world's first high-speed commercial magnetic levitation line, whose trains run on non-conventional track and reach a top speed of 430 km/h (267 mph). High-speed rail in China is officially defined as "newly-built passenger-dedicated rail lines designed for electrical multiple unit (EMU) train sets traveling at not less than 250 km/h (155 mph) (including lines with reserved capacity for upgrade to the 250 km/h standard) on which initial service operate at not less than 200 km/h (124 mph)." EMU train sets have no more than 16 railcars with axle load not greater than 17 tonnes and service interval of not less than three minutes. Thus, high-speed rail service in China requires high-speed EMU train sets to be providing passenger service on high speed rail lines at speeds of not less than 200 km/h (124 mph). EMU trains operating on non-high speed track or otherwise but at speeds below 200 km/h are not considered high-speed rail. Certain mixed use freight and passenger rail lines, that can be upgraded for train speeds of 250 km/h, with current passenger service of at least 200 km/h (124 mph), are also considered high-speed rail. In common parlance, high-speed train service in China generally refers to G-, D- and C-class passenger train service. G-class (for gaotie simplified Chinese: 高铁; traditional Chinese: 高鐵 or "high speed rail") train service generally features EMU trains running on passenger-dedicated high-speed rail lines and operating at top speeds of at least 250 km/h. For example, the G7 train from Beijing South to Shanghai Hongqiao, which runs on the Beijing–Shanghai HSR, a line with an operating speed of 350 km/h (217 mph). D-class (for dongche 动车 or "electrical multiple unit") train service features EMU trains running at lower speeds, whether on high-speed or non-high-speed track. D-class trains can vary widely in actual trip speed. The non-stop D211 train from Guiyang East to Guangzhou South on the Guiyang–Guangzhou HSR, a line with designed speed of 250 km/h, averages 207 km/h for the trip. The D312 EMU sleeper train between Beijing South and Shanghai on the non-high speed Beijing–Shanghai railway averages 121 km/h for the trip. C-class (for chengji 城际 or "intercity") train service that operate on high-speed track at speeds above 250 km/h are also considered high-speed rail service. For example, C-class trains on the Beijing–Tianjin ICR, a line with designed speed of 350 km/h, reach top speeds of 330 km/h (205 mph) and average 226 km/h (140 mph) for the trip. High-speed ridership statistics in China are often reported as the number of passengers carried by high-speed EMU train sets, and such figures typically include passengers on EMU trains operating on non-high speed track or at service speeds below 200 km/h. The Asia Express steam locomotive, which operated commercially from 1934 to 1943 in Manchuria could reach 130 km/h (81 mph) and was one of the fastest trains in Asia. The earliest example of higher-speed commercial train service in China was the Asia Express, a luxury passenger train that operated in Japanese-controlled Manchuria from 1934 to 1943. The steam-powered train, which ran on the South Manchuria Railway from Dalian to Xinjing (Changchun), had a top commercial speed of 110 km/h (68 mph) and a test speed of 130 km/h (81 mph). It was faster than the fastest trains in Japan at the time. After the founding of the People's Republic of China in 1949, this train model was renamed the SL-7 and was used by the Chinese Minister of Railways. In the early 1990s, diesel locomotives in China could attain a maximum speed of 120 km/h (75 mph) on passenger trains. Here a N595 diesel locomotive is shown hauling passenger coaches on the Guangzhou–Sanshui Railway at Foshan in 2008. 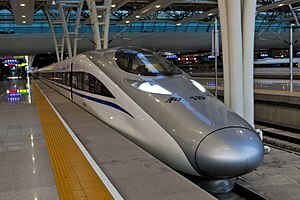 State planning for China's current high-speed railway network began in the early 1990s under a strong leadership of Deng Xiaoping who set up what is currently called a "high-speed rail dream" after his visit to Japan in 1978, where he was deeply impressed by the world's first high speed rail, Shinkansen. In December 1990, the Ministry of Railways (MOR) submitted to the National People's Congress a proposal to build a high-speed railway between Beijing and Shanghai. At the time, the Beijing–Shanghai Railway was already at capacity, and the proposal was jointly studied by the Science & Technology Commission, State Planning Commission, State Economic & Trade Commission, and the MOR. In December 1994, the State Council commissioned a feasibility study for the line. Policy planners debated the necessity and economic viability of high-speed rail service. Supporters argued that high-speed rail would boost future economic growth. Opponents noted that high-speed rail in other countries were expensive and mostly unprofitable. Overcrowding on existing rail lines, they said, could be solved by expanding capacity through higher speed and frequency of service. In 1995, Premier Li Peng announced that preparatory work on the Beijing Shanghai HSR would begin in the 9th Five Year Plan (1996–2000), but construction was not scheduled until the first decade of the 21st century. From 1998 until 2007 the Guangshen Railway Company operated a "Xinshisu" Swedish SJ 2000 high-speed train on the Guangshen Railway as the Guangdong Through Train from Zhaoqing railway station in Guangdong Province to Hung Hom Station in Hong Kong. The Xinshisu trainset was shipped back to Sweden in 2012. In 2007, the Guangshen Railway became the first in the country to have four tracks, allowing faster passenger train traffic (on dedicated tracks third and fourth from the right) to be separated from slower freight traffic (on tracks second and fifth from the right). In 1993, commercial train service in China averaged only 48 km/h (30 mph) and was steadily losing market share to airline and highway travel on the country's expanding network of expressways. The MOR focused modernization efforts on increasing the service speed and capacity on existing lines through double-tracking, electrification, improvements in grade (through tunnels and bridges), reductions in turn curvature, and installation of continuous welded rail. Through five rounds of "Speed-Up" campaigns in April 1997, October 1998, October 2000, November 2001, and April 2004, passenger service on 7,700 km (4,800 mi) of existing tracks was upgraded to reach sub-high speeds of 160 km/h (100 mph). A notable example is the Guangzhou-Shenzhen Railway, which in December 1994 became the first line in China to offer sub-high-speed service of 160 km/h (99 mph) using domestically-produced DF-class diesel locomotives. The line was electrified in 1998, and Swedish-made X 2000 trains increased service speed to 200 km/h (124 mph). After the completion of a third track in 2000 and a fourth in 2007, the line became the first in China to run high-speed passenger and freight service on separate tracks. The completion of the sixth round of the "Speed-Up" Campaign in April 2007 brought HSR service to more existing lines: 423 km (263 mi) capable of 250 km/h (155 mph) train service and 3,002 km (1,865 mi) capable of 200 km/h (124 mph). [N 1] In all, travel speed increased on 22,000 km (14,000 mi), or one-fifth, of the national rail network, and the average speed of passenger trains improved to 70 km/h (43 mph). The introduction of more non-stop service between large cities also helped to reduce travel time. The non-stop express train from Beijing to Fuzhou shortened travel time from 33.5 to less than 20 hours. In addition to track and scheduling improvements, the MOR also deployed faster CRH series trains. During the Sixth Railway Speed Up Campaign, 52 CRH trainsets (CRH1, CRH2 and CRH5) entered into operation. The new trains reduced travel time between Beijing and Shanghai by two hours to just under 10 hours. Some 295 stations have been built or renovated to allow high-speed trains. The development of the HSR network in China was initially delayed by a debate over the type of track technology to be used. In June 1998, at a State Council meeting with the Chinese Academies of Sciences and Engineering, Premier Zhu Rongji asked whether the high-speed railway between Beijing and Shanghai still being planned could use maglev technology. At the time, planners were divided between using high-speed trains with wheels that run on conventional standard gauge tracks or magnetic levitation trains that run on special maglev tracks for a new national high-speed rail network. Maglev received a big boost in 2000 when the Shanghai Municipal Government agreed to purchase a turnkey TransRapid train system from Germany for the 30.5 km (19.0 mi) rail link connecting Shanghai Pudong International Airport and the city. In 2004, the Shanghai Maglev Train became the world's first commercially operated high-speed maglev. It remains the fastest commercial train in the world with peak speeds of 431 km/h (268 mph) and makes the 30.5 km (19.0 mi) trip in less than 7.5 minutes. The China Railways SS8 (Shaoshan 8) electric locomotive was produced from 1996 to 2001 and provided sub-high-speed rail service. The train set a Chinese rail speed record of 240 km/h (150 mph) in 1998. The domestically-produced China Railways DJJ1 (Blue Arrow) train, first deployed on the Guangzhou-Shenzhen Railway in 2001, could attain a top speed of 235.6 km/h (146.4 mph). The DJJ1 trains were transferred to lines in southwest China in 2008. The China Railways DJF2 (Xianfeng) train was produced in 2001 and set a speed record of 292.8 km/h (181.9 mph) on September 10, 2002. The train operated in commercially on conventional rail lines in southwest China from 2007 to 2010. 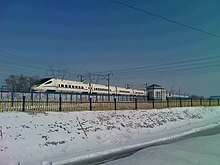 The domestically-produced China Railways DJJ2 (China Star) high-speed train set speed record of 321 km/h (199 mph) on the Qinshen Passenger Railway, and was used in commercial service briefly from 2006 to 2007 before it was abandoned in favor of imported high-speed train technology. The Shanghai Maglev Train running on a special maglev track, departing the Shanghai Pudong International Airport. The maglev train can reach a top speed of 431 km/h (268 mph). Despite unmatched advantage in speed, the maglev has not gained widespread use in China's high-speed rail network due to high cost, German refusal to share technology and concerns about safety. The price tag of the Shanghai Maglev was believed to be $1.3 billion and was partially financed by the German government. The refusal of the Transrapid Consortium to share technology and source production in China made large-scale maglev production much more costly than high-speed train technology for conventional lines. Finally, residents living along the proposed maglev route have raised health concerns about noise and electromagnetic radiation emitted by the trains, despite an environmental assessment by the Shanghai Academy of Environmental Sciences saying the line was safe. These concerns have prevented the construction of the proposed extension of the maglev to Hangzhou. Even the more modest plan to extend the maglev to Shanghai's other airport, Hongqiao, has stalled. Instead, a conventional subway line was built to connect the two airports, and a conventional high-speed rail line was built between Shanghai and Hangzhou. While maglev was drawing attention to Shanghai, conventional track HSR technology was being tested on the newly completed Qinhuangdao-Shenyang Passenger Railway. This 405 km (252 mi) standard gauge, dual-track, electrified line was built between 1999 and 2003. In June 2002, a domestically made DJF2 train set a record of 292.8 km/h (181.9 mph) on the track. The China Star (DJJ2) train followed the same September with a new record of 321 km/h (199 mph). The line supports commercial train service at speeds of 200–250 km/h (120–160 mph), and has become a segment of the rail corridor between Beijing and Northeast China. The Qinhuangdao-Shenyang Line showed the greater compatibility of HSR on conventional track with the rest of China's standard gauge rail network. In 2004, the State Council in its Mid-to-Long Term Railway Development Plan, adopted conventional track HSR technology over maglev for the Beijing–Shanghai High Speed Railway and three other north-south high-speed rail lines. This decision ended the debate and cleared the way for rapid construction of standard gauge, passenger dedicated HSR lines in China. Despite setting speed records on test tracks, the DJJ2, DJF2 and other domestically-produced high-speed trains were insufficiently reliable for commercial operation. The State Council turned to advanced technology abroad but made clear in directives that China's HSR expansion cannot only benefit foreign economies. China's expansion must also be used to develop its own high-speed train building capacity through technology transfers. The State Council, MOR and state-owned train builders, the China North Car (CNR) and China South Car (CSR) used China's large market and competition among foreign train-makers to force technology transfers of foreign high speed rail technology, as the DJJ2 and DJF2 high speed trains were not reliable enough before the technology transfers, which would later allow the Chinese government through CRRC to make the more reliable Fuxing Hao and Hexie Hao trains. The CRH380 series(or family) of trains, was initially built with direct cooperation (or help) from foreign trainmakers. But newer Trainsets are based on transferred technology, just like the Hexie and Fuxing Hao. In 2003, the MOR was believed to favor Japan's Shinkansen technology, especially the 700 series. The Japanese government touted the 40-year track record of the Shinkansen and offered favorable financing. A Japanese report envisioned a winner-take all scenario in which the winning technology provider would supply China's trains for over 8,000 km (5,000 mi) of high-speed rail. However, Chinese citizens angry with Japan's denial of World War II atrocities organized a web campaign to oppose the awarding of HSR contracts to Japanese companies. The protests gathered over a million signatures and politicized the issue. The MOR delayed the decision, broadened the bidding and adopted a diversified approach to adopting foreign high-speed train technology. In June 2004, the MOR solicited bids to make 200 high-speed train sets that can run 200 km/h (124 mph). Alstom of France, Siemens of Germany, Bombardier Transportation based in Germany and a Japanese consortium led by Kawasaki all submitted bids. With the exception of Siemens which refused to lower its demand of CN¥350 million per train set and €390 million for the technology transfer, the other three were all awarded portions of the contract. All had to adapt their HSR train-sets to China's own common standard and assemble units through local joint ventures (JV) or cooperate with Chinese manufacturers. Bombardier, through its joint venture with CSR's Sifang Locomotive and Rolling Stock Co (CSR Sifang), Bombardier Sifang (Qingdao) Transportation Ltd (BST). won an order for 40 eight-car train sets based on Bombardier's Regina design. These trains, designated CRH1A, were delivered in 2006. Kawasaki won an order for 60 train sets based on its E2 Series Shinkansen for ¥9.3 billion. Of the 60 train sets, three were directly delivered from Nagoya, Japan, six were kits assembled at CSR Sifang Locomotive & Rolling Stock, and the remaining 51 were made in China using transferred technology with domestic and imported parts. They are known as CRH2A. Alstom also won an order for 60 train sets based on the New Pendolino developed by Alstom-Ferroviaria in Italy. The order had a similar delivery structure with three shipped directly from Savigliano along with six kits assembled by CNR's Changchun Railway Vehicles, and the rest locally made with transferred technology and some imported parts. Trains with Alstom technology carry the CRH5 designation. The following year, Siemens reshuffled its bidding team, lowered prices, joined the bidding for 350 km/h (217 mph) trains and won a 60-train set order. It supplied the technology for the CRH3C, based on the ICE3 (class 403) design, to CNR's Tangshan Railway Vehicle Co. Ltd. The transferred technology includes assembly, body, bogie, traction current transforming, traction transformers, traction motors, traction control, brake systems, and train control networks. Achieving indigenous high-speed rail technology has been a major goal of Chinese state planners. Chinese train-makers, after receiving transferred foreign technology, have been able to achieve a considerable degree of self-sufficiency in making the next generation of high-speed trains by developing indigenous capability to produce key parts and improving upon foreign designs. The CRH380AL train set, shown above at the Beijing South Railway Station, set a record speed of 486.1 km/h (302.0 mph) on Dec. 3, 2010. The record was broken by a CRH380BL train set on Jan. 9, 2011, which reached 487.3 km/h (302.8 mph). Examples of technology transfer include Mitsubishi Electric’s MT205 traction motor and ATM9 transformer to CSR Zhuzhou Electric, Hitachi’s YJ92A traction motor and Alstom’s YJ87A Traction motor to CNR Yongji Electric, Siemens’ TSG series pantograph to Zhuzhou Gofront Electric. Most of the components of the CRH trains manufactured by Chinese companies were from local suppliers, with only a few parts imported. For foreign train-makers, technology transfer is an important part of gaining market access in China. Bombardier, the first foreign train-maker to form a joint venture in China, has been sharing technology for the manufacture of railway passenger cars and rolling stock since 1998. Zhang Jianwei, President and Chief Country Representative of Bombardier China, stated that in a 2009 interview, “Whatever technology Bombardier has, whatever the China market needs, there is no need to ask. Bombardier transfers advanced and mature technology to China, which we do not treat as an experimental market.” Unlike other series which have imported prototypes, all CRH1 trains have been assembled at Bombardier’s joint-venture with CSR, Bombardier Sifang in Qingdao. Kawasaki’s cooperation with CSR did not last as long. Within two years of cooperation with Kawasaki to produce 60 CRH2A sets, CSR began in 2008 to build CRH2B, CRH2C and CRH2E models at its Sifang plant independently without assistance from Kawasaki. According to CSR president Zhang Chenghong, CSR "made the bold move of forming a systemic development platform for high-speed locomotives and further upgrading its design and manufacturing technology. Later, we began to independently develop high-speed CRH trains with a maximum velocity of 300–350 kilometers per hour, which eventually rolled off the production line in December 2007." Since then, CSR has ended its cooperation with Kawasaki. Kawasaki challenged China's high-speed rail project for patent theft, but backed off the effort. Between June and September 2005, the MOR launched bidding for high-speed trains with a top speed of 350 km/h (217 mph), as most of the main high-speed rail lines were designed for top speeds of 350 km/h or higher. Along with CRH3C, produced by Siemens and CNR Tangshan, CSR Sifang bid 60 sets of CRH2C. In 2007, travel time from Beijing to Shanghai was about 10 hours at a top speed of 200 km/h (124 mph) on the upgraded Beijing–Shanghai Railway. To increase transport capacity, the MOR ordered 70 16-car trainsets from CSR Sifang and BST, including 10 sets of CRH1B and 20 sets of CRH2B seating trains, 20 sets of CRH1E and 20 sets of CRH2E sleeper trains. Construction of the high-speed railway between Beijing and Shanghai, the world's first high-speed rail with a designed speed of 380 km/h (236 mph), began on April 18, 2008. In the same year, the Ministry of Science and the MOR agreed to a joint action plan for the indigenous innovation of high-speed trains in China. The MOR then launched the CRH1-350 (Bombardier and BST, designated as CRH380D), CRH2-350 (CSR, designated as CRH380A/AL), and CRH3-350 (CNR and Siemens, designated as CRH380B/BL & CRH380CL), to develop a new generation of CRH trains with a top operation speed of 380 km/h. A total of 400 new generation trains were ordered. The CRH380A/AL, the first indigenous high-speed train of the CRH series, entered service on the Shanghai-Hangzhou High-Speed Railway on October 26, 2010. On October 19, 2010, the MOR announced the beginning of research and development of "super-speed" railway technology, which would increase the maximum speed of trains to over 500 km/h (311 mph). After committing to conventional-track high-speed rail in 2006, the state embarked on an ambitious campaign to build passenger-dedicated high-speed rail lines, which accounted for a large part of the government's growing budget for rail construction. Total investment in new rail lines grew from $14 billion in 2004 to $22.7 and $26.2 billion in 2006 and 2007. In response to the global economic recession, the government accelerated the pace of HSR expansion to stimulate economic growth. Total investments in new rail lines including HSR reached $49.4 billion in 2008 and $88 billion in 2009. In all, the state planned to spend $300 billion to build a 25,000 km (16,000 mi) HSR network by 2020. CRH3 trains on the Wuhan–Guangzhou high-speed railway in February 2010. The line, which opened in December 2009, reduced travel time by rail between Wuhan and Guangzhou from 10.5 hours to just over three hours. The new Wuhan railway station under construction in 2009. As of 2007, the Qinhuangdao-Shenyang high-speed railway, which carried trains at top speed of 250 km/h (155 mph) along the Liaoxi Corridor in the Northeast, was the only passenger-dedicated HSR line (PDL) in China, but that would soon change as the country embarked on a high-speed railway construction boom. Higher-speed express train service allowed more trains to share the tracks and improved rail transport capacity. But high-speed trains often have to share tracks with slower, heavy freight trains—in some cases with as little as 5 minutes headway. To attain higher speeds and transport capacity, planners began to propose a passenger-dedicated HSR network on a grand scale. Initiated by MOR's 2004 "Mid-to-Long Term Railway Network Plan", a national grid composed of eight high-speed rail corridors, four running north-south and four going east-west, was to be constructed. The envisioned network, together with upgraded existing lines, would total 12,000 km (7,456 mi) in length. Most of the new lines follow the routes of existing trunk lines and are designated for passenger travel only. They became known as passenger-designated lines (PDLs). Several sections of the national grid, especially along the southeast coastal corridor, were built to link cities that had no previous rail connections. Those sections will carry a mix of passenger and freight. High-speed trains on PDLs can generally reach 300–350 km/h (190–220 mph). On mixed-use HSR lines, passenger train service can attain peak speeds of 200–250 km/h (120–160 mph). The earliest PDLs built were sections of the corridors that connected large cities in the same region. On April 19, 2008, Hefei–Nanjing PDL in the East opened with a top-speed of 250 km/h (155 mph). On August 1, 2008, the Beijing–Tianjin intercity railway opened in time for the 2008 Summer Olympics. This line between northern China’s two largest cities, was the first in the country to accommodate commercial trains with top speed of 350 km/h (217 mph) and featured the CRH2C and CRH3C train sets. This ambitious national grid project was planned to be built by 2020, but the government's stimulus has expedited time-tables considerably for many of the lines. The Wuhan–Guangzhou high-speed railway (Wuguang PDL), which opened on December 26, 2009, was the country’s first cross-regional high-speed rail line. With a total length of 968 km (601 mi) and capacity to accommodate trains traveling at 350 km/h (217 mph), the Wuguang PDL set a world record for the fastest commercial train service with average trip speed of 312.5 km/h (194.2 mph). Train travel between central and southern China’s largest cities, Wuhan and Guangzhou, was reduced to just over three hours. On October 26, 2010, China opened its 15th high-speed rail, the Shanghai–Hangzhou line, and unveiled the CRH380A trainset manufactured by CSR Sifang started regular service. The Beijing–Shanghai high-speed railway, the second major cross-regional line, opened on June 2011 and was the first line designed with a top speed of 380 km/h (236 mph) in commercial service. By January 2011, China had the world’s longest high-speed rail network with about 8,358 km (5,193 mi) of routes capable for at least 200 km/h (124 mph) running in service including 2,197 km (1,365 mi) of rail lines with top speeds of 350 km/h (217 mph). [dead link] The MOR reportedly committed investment of ¥709.1 billion (US$107.9 billion) in railway construction in 2010 and would invest ¥700 billion (US$106 billion) in 2011 on 70 railway projects, including 15 high-speed rail projects. Some 4,715 kilometres (2,930 mi) of new high-speed railways would be opened, and by the end of 2011, China would have 13,073 kilometres (8,123 mi) of railways capable of carrying trains at speeds of at least 200 km/h (124 mph). In February 2011, Railway Minister Liu Zhijun, a key proponent of HSR expansion in China, was removed from office on charges of corruption. The Economist estimates Liu accepted ¥1 billion of bribes ($152 million) in connection with railway construction projects. Investigators found evidence that another ¥187 million ($28.5 million) was misappropriated from the $33 billion Beijing–Shanghai high-speed railway in 2010. Another top official in the Railways Ministry, Zhang Shuguang, was also sacked for corruption. Zhang was estimated to have misappropriated to his personal overseas accounts the equivalent of $2.8 billion. Former Railway Minister Liu Zhijun hosting Nancy Pelosi and Edward Markey, members of the United States Congress, in Beijing in 2009. After the political shake-up, concerns about HSR safety, high ticket prices, financial sustainability and environmental impact received greater scrutiny in the Chinese press. In April 2011, the new Minister of Railways Sheng Guangzu said that due to corruption, safety may have been compromised on some construction projects and completion dates may have to be pushed back. Sheng announced that all trains in the high-speed rail network would operate at a maximum speed of 300 km/h (186 mph) beginning on July 1, 2011. This was in response to concerns over safety, low ridership due to high ticket prices, and high energy usage. On June 13, 2011, the MOR clarified in a press conference that the speed reduction was not due to safety concerns but to offer more affordable tickets for trains at 250 km/h (155 mph) and increase ridership. Higher-speed train travel uses greater energy and imposes more wear on expensive machinery. Railway officials lowered the top speed of trains on most lines that were running at 350 km/h (217 mph) to 300 km/h (186 mph). Trains on the Beijing-Tianjin high-speed line and a few other inter-city lines remained at 350 km/h. In May 2011, China's Environmental Protection Ministry ordered the halting of construction and operation of two high-speed lines that failed to pass environmental impact tests. In June, the MOR maintained that high-speed rail construction was not slowing down. The CRH380A trainsets on the Beijing–Shanghai high-speed railway could reach a top operational speed of 380 km/h (240 mph) but were limited to 300 km/h. Under political and public pressure, the National Audit Office (NAO) carried out an extensive investigation into the building quality of all high-speed rail lines. As of March 2011, no major quality defects had been found in the system. Foreign manufacturers involved in Shanghai-Beijing high-speed link reported that their contracts call for maximum operational speed of 300 km/h (186 mph). From July 20, 2011, the frequency of train service from Jinan to Beijing and Tianjin was reduced due to low occupancy, which renewed concerns about demand and profitability for high-speed services. Service failures in the first month of operation drove passengers back to pre-existing slower rail service and air travel; airline ticket prices rebounded due to reduced competition. On July 23, 2011, two high-speed trains collided on the Ningbo–Taizhou–Wenzhou railway in Lucheng District of Wenzhou, Zhejiang Province. The accident occurred when one train traveling near Wenzhou was struck by lightning, lost power and stalled. Signals malfunctioned, causing another train to rear-end the stalled train. Several carriages derailed. State-run Chinese media confirmed 40 deaths, and at least 192 people hospitalised, including 12 who were severely injured. The Wenzhou train accident and the lack of accountability by railway officials caused a public uproar and heightened concerns about the safety and management of China's high-speed rail system. Quality and safety concerns also affected plans to export cheaper high-speed train technology to other countries. Following the deadly crash, the Chinese government suspended new railway project approvals and launched safety checks on existing equipment. A commission was formed to investigate the accident with a directive to report its findings in September 2011. On August 10, 2011, the Chinese government announced that it was suspending approvals of any new high-speed rail lines pending the outcome of the investigation. The Minister of Railways announced further cuts in the speed of Chinese high-speed trains, with the speed of the second-tier 'D' trains reduced from 250 km/h (155 mph) to 200 km/h (124 mph), and 200 km/h to 160 km/h on upgraded pre-existing lines. 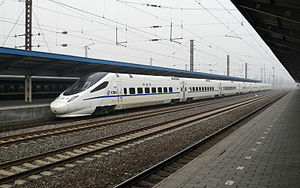 The speed of the remaining 350 km/h (217 mph) trains between Shanghai and Hangzhou was reduced to 300 km/h (186 mph) as of August 28, 2011. To stimulate ridership, on August 16, 2011 ticket prices on high-speed trains were reduced by five percent. From July to September, high-speed rail ridership in China fell by nearly 30 million to 151 million trips. A comprehensive inspection train is testing its performance under high altitude and low temperature condition in Heilongjiang, Northeast China. In the first half of 2011, the MOR as a whole made a profit of ¥4.29 billion and carried a total debt burden of ¥2.09 trillion, equal to about 5% of China’s GDP. Earnings from the more profitable freight lines helped to off-set losses by high-speed rail lines. As of years ending 2008, 2009 and 2010, the MOR's debt-to-asset ratio was respectively, 46.81%, 53.06% and 57.44%, and reached 58.58% by mid-year 2011. As of October 12, 2011, the MOR had issued ¥160 billion of debt for the year. But in the late summer, state banks began to cut back on lending to rail construction projects, which reduced funding for existing railway projects. An investigation of 23 railway construction companies in August 2011 revealed that 70% of existing projects had been slowed or halted mainly due to shortage of funding. Affected lines included Xiamen-Shenzhen, Nanning-Guangzhou, Guiyang-Guangzhou, Shijazhuang-Wuhan, Tianjin-Baoding and Shanghai-Kunming high-speed rail lines. By October, work had halted on the construction of 10,000 km (6,200 mi) of track. New projects were put on hold and completion dates for existing projects, including the Tianjin-Baoding, Harbin-Jiamusi, Zhengzhou-Xuzhou and Hainan Ring (West), were pushed back. As of October 2011, the MOR was reportedly concentrating remaining resources on fewer high-speed rail lines and shifting emphasis to more economically viable coal transporting heavy rail. To ease the credit shortage facing rail construction, the Ministry of Finance announced tax cuts to interest earned on rail construction financing bonds and the State Council ordered state banks to renew lending to rail projects. In late October and November 2011, the MOR raised RMB 250 billion in fresh financing and construction resumed on several lines including the Tianjin-Baoding, Xiamen-Shenzhen and Shanghai-Kunming. By early 2012, the Chinese government renewed investments in high-speed rail to rejuvenate the slowing economy. Premier Wen Jiabao visited train manufacturers and gave a vote of confidence in the industry. Over the course of the year, the MOR’s budget rose from $64.3 billion to $96.5 billion. Five new lines totaling 2,563 km (1,593 mi) in length entered operation between June 30 and December 31, including the Beijing-Wuhan section of the Beijing-Guangzhou line. By the end of 2012, the total length of high-speed rail tracks had reached 9,300 km (5,800 mi), and ridership rebounded and exceeded levels prior to the Wenzhou crash. China's 1,580 high-speed trains were transporting 1.33 million passengers daily, about 25.7% of the overall passenger traffic. The Beijing–Tianjin, Shanghai–Nanjing, Beijing–Shanghai and Shanghai–Hangzhou lines reported breaking even financially The Shanghai-Nanjing line even reported to be operationally profitable, operating with a 380 million yuan net profit. However the system as a whole is still losing money and concerns about corruption, safety and high ticket prices persist. On December 28, 2013, the total length of high-speed rail tracks nationally topped 10,000 km (6,200 mi) with the opening of the Xiamen–Shenzhen, Xian–Baoji, Chongqing−Lichuan high-speed railways as well as intercity lines in Hubei and Guangxi. In 2014, high-speed rail expansion gained speed with the opening of the Taiyuan–Xi'an, Hangzhou–Changsha, Lanzhou-Ürümqi, Guiyang-Guangzhou, Nanning-Guangzhou trunk lines and intercity lines around Wuhan, Chengdu, Qingdao and Zhengzhou. High-speed passenger rail service expanded to 28 provinces and regions. The number of high-speed train sets in operation grew from 1,277 pairs in June to 1,556.5 pairs in December. In response to a slowing economy, central planners approved a slew of new lines including Shangqiu-Hefei-Hangzhou, Zhengzhou-Wanzhou, Lianyungang-Zhenjiang, Linyi-Qufu, Harbin-Mudanjiang, Yinchuan-Xi'an, Datong-Zhangjiakou, and intercity lines in Zhejiang and Jiangxi. The government actively promoted the export of high-speed rail technology to countries including Mexico, Thailand, the United Kingdom, India, Russia and Turkey. To better compete with foreign trainmakers, the central authorities arranged for the merger of the country's two main high-speed train-makers, CSR and CNR, into CRRC. By 2015, six high speed rail lines, Beijing–Tianjin, Shanghai–Nanjing, Beijing–Shanghai, Shanghai–Hangzhou, Nanjing–Hangzhou and Guangzhou–Shenzhen–Hong Kong report operational profitability. The Beijing–Shanghai is particularly profitable reporting a 6.6 billion yuan net profit. In 2016, with the near completion of the National 4+4 grid, a new "Mid-to-Long Term Railway Network" Plan was drafted. The plan envisions a larger 8+8 high speed rail grid serving the nation and expanded intercity lines for regional and commuter services for large metropolitan areas of China. The proposed completion date for the network is 2030. China's high-speed rail expansion is entirely managed, planned and financed by the Chinese government. On one hand, the demand of high-speed rail in China steadily increases over time. In 2012, the average occupancy rate of high-speed rails in China is 57%. This percentage increases to 65%, 69.4% and 72.1% in the year of 2013, 2014 and 2015, respectively. Up to February 2016, high-speed rails covers nearly 200 thousand kilometers. On the other hand, however, public concerns and questions about the high-speed rail development from various perspectives have been raised as well. The safety issue that drew the attention of the public and the government was the Wenzhou train collision which happened in July 23, 2011, in which 40 people died, 172 injured and 54 related officials blamed and punished. An engineer of China's high-speed rail, who asked not to be named, claimed that he would never take a single ride on China's high-speed railway on his retirement. He complained about the disparity between construction plan and actual construction schedule. "I'm not able to stop any violation to construction plan even if I know such violations may impair the safety of the railway, because it is always the administrative leaders that are making decisions." said the engineer. The data, however, is telling a different story. With at least 70,000 Chinese people died from traffic collision, crashes and rollover every year (this number only include those confirmed by the police), statistically, driving is at least 6 to 20 times more likely to result in accidents and deaths compared to railway transportation. Besides safety issue, efficiency is also a significant concern that both Chinese and foreign researchers have. In 2016, Chinese railways carried almost 2 trillion ton-kilometers of freight and over 1 billion passenger-kilometer of passengers, making it one of the world's most intensively used freight and passenger railway networks in the world. However, the rail staff productivity upon railway track infrastructure index in China is less than 0.05, being the lowest among the countries with significant railway construction. The government also articulated the importance and urgency of assuring the capacity of railway staff, especially their familiarity with telecommunication and signaling testing in the official investigation of the Wenzhou train collision. In addition, it is hard to identify problems in the construction process, given the distribution resource planning system needed for rapid railway building and assembling. Suppliers and manufacturers blame each other for any problem detected in the trial operation, while tracking the construction process to every single detail is an almost impossible job for inspectors. Despite having the second largest route-kilometer growth after Turkey since 2017, whether constructing high-speed railways in China is economically efficient has been a hot debate. Conservative scholars and officials are worried about the profitability of high-speed railway construction, and its influence on low income population. While all high-speed rails built on the eastern part of China except Beijing-Tianjin high-speed rail have started to make positive profit since 2015, the middle-west railways are constantly loss-making and far from being even possible to pay their cost off. Zhengzhou–Xi'an high-speed railway is estimated to run 59 trains in 2010 and 125 trains in 2018, yet in 2016 there are merely around 30 trains on operation, causing a 1.4 billion loss. Guizhou–Guangxi railway and Lanzhou–Xinjiang railway are both suffering from high maintenance cost due to harsh climate conditions and complicated terrain structure. Improves economic productivity and competitiveness over the long term by increasing the transport capacity of railways and linking labor markets. Moving passengers to high-speed lines frees up older railways to carry more freight, which is more profitable for railways than passengers, whose fares are subsidized. Stimulates the economy in the short term as HSR construction creates jobs and drives up demand for construction, steel and cement industries during the economic downturn. Work on the Beijing–Shanghai HSR mobilized 110,000 workers. Facilitates cross-city economic integration and promotes the growth of second-tier cities. The introduction of the high-speed railways is responsible for 59% of the increase in market potential for the secondary cities connected by bullet trains. (Market potential, a concept used by economic geographers, measures "a geographic area's access to markets for inputs and outputs.") A 10% increase in a secondary city's market potential is expected to be associated with a 4.5% increase in its average real estate price. Supports energy independence and environmental sustainability. Electric trains use less energy to transport people and goods on a per unit basis and can draw power from more diverse sources of energy including renewables than automobile and aircraft, which are more reliant on imported petroleum. Develop an indigenous high-speed rail equipment industry. The expansion into HSR is also developing China into a leading source of high-speed rail building technology. Chinese train-makers have absorbed imported technologies quickly, localized production processes, and even begun to compete with foreign suppliers in the export market. Six years after receiving Kawasaki's license to produce Shinkansen E2, CSC Sifang can produce the CRH2A without Japanese input, and Kawasaki has ended cooperation with Sifang on high-speed rail. China's high-speed rail construction projects are highly capital intensive. About 40-50% of financing is provided by the national government through lending by state owned banks and financial institutions, another 40% by the bonds issued by the Ministry of Railway (MOR) and the remaining 10-20% by provincial and local governments. The MOR, through its financing arm, the China Rail Investment Corp (CRIC), issued an estimated ¥1 trillion (US$150 billion in 2010 dollars) in debt to finance HSR construction from 2006 to 2010, including ¥310 billion in the first 10 months of 2010. CRIC has also raised some capital through equity offerings; in the spring of 2010, CRIC sold a 4.5 percent stake in the Beijing–Shanghai high-speed railway to the Bank of China for ¥6.6 billion and a 4.537 percent stake to the public for ¥6 billion. CRIC retained 56.2 percent ownership on that line. As of 2010, the CRIC-bonds are considered to be relatively safe investments because they are backed by assets (the railways) and implicitly by the government. Table:Construction cost of HSR lines in operation. Shangrao railway station with a 380BL train serving the Hefei–Fuzhou HSR on the upper platforms and a 380A train serving the Hangzhou–Changsha HSR in the lower platform. Large construction debt-loads require significant revenues from rider fares, subsidies, and/or other sources of income, such as advertising, to repay. Despite impressive ridership figures, virtually every completed line has incurred losses in its first years of operation. For example, the Beijing–Tianjin intercity railway in its two full years of operation, delivered over 41 million rides. The line cost ¥20.42 billion to build, and ¥1.8 billion per annum to operate, including ¥0.6 billion in interest payments on its ¥10 billion of loan obligations. The terms of the loans range from 5–10 years at interest rates of 6.3 to 6.8 percent. In its first year of operation from August 1, 2008 to July 31, 2009, the line carried 18.7 million riders and generated ¥1.1 billion in revenues, which resulted in a loss of ¥0.7 billion. In the second year, ridership rose to 22.3 million and revenues improved to ¥1.4 billion, which narrowed losses somewhat to below ¥0.5 billion. To break even, the line must deliver 30 million rides annually. To be able to repay principal, ridership would need to exceed 40 million. In September 2010, daily ridership averaged 69,000 or an annual rate of 25.2 million. In 2013, ridership totaled 25.85 million. The line has a capacity of delivering 100 million rides annually and initial estimated repayment period of 16 years. The Shijiazhuang-Taiyuan PDL lost ¥0.8 billion in its first year and is set to lose ¥0.9 billion in 2010. The Southeast HSR corridor lost ¥0.377 billion in its first year beginning August 2009. The Zhengzhou-Xian HSR since opening in February 2010 was expected to generate revenues of ¥0.6 billion in its first full year but must make interest payments of ¥1.1 billion. In the first three quarters of 2012, the line lost Y1.87 billion. The losses must be covered by the operator, which is usually subsidized by local governments. In December 2014, the Henan provincial government imposed a rule requiring municipal authorities pay 70% of the deficit incurred by Henan's intercity lines with the provincial authorities paying the remainder 30%. The MOR faces a debt-repayment peak in 2014. Some economists recommend further subsidies to lower fares and boost ridership and ultimately revenues. Others warn that the financing side of the existing construction and operation model is unsustainable. If the rail-backed loans cannot be fully repaid, they may be refinanced or the banks may seize ownership of the railways. To prevent that eventuality, the MOR is trying to improve management of its rapidly growing HSR holdings. Overall, ridership is growing as the high-speed rail network continues to expand. High-speed rail is also becoming relatively more affordable as fares have remained stable while worker wages have grown sharply over the same period. Currently, China's high-speed rail service costs significantly less than similar systems in other developed countries, but is considerably more expensive than conventional rail service. In comparison, high speed train tickets in France or Germany cost slightly over US$0.10 per kilometer and the various Shinkansen services hover above US$0.20 per kilometer. The spread of high-speed rail has forced domestic airlines in China to slash airfare and cancel regional flights. The impact of high-speed rail on air travel is most acute for intercity trips under 500 km (310 mi). By the spring of 2011, commercial airline service had been completely halted on previously popular routes such as Wuhan-Nanjing, Wuhan-Nanchang, Xi’an-Zhengzhou and Chengdu-Chongqing. Flights on routes over 1,500 km (930 mi) are generally unaffected. As of October 2013, high-speed rail was carrying twice as many passengers each month as the country’s airlines. China's high-speed railway network is by far the longest in the world. As of June 2018 it extends to 29 of the country's 33 provincial-level administrative divisions and stands at 26,869 km (16,696 mi) in total length, accounting for about 64% of the world's high-speed rail tracks in commercial service. Long term plans call for expansion of network length to 38,000 km (23,612 mi) by 2025. Map showing projected high-speed rail network in China by 2020 and the travel time by rail from Beijing to each of the provincial capitals. The centerpiece of China's expansion into high-speed rail is a national high-speed rail grid consisting of mainly passenger dedicated lines that is overlaid onto the existing railway network. The grid is composed of eight high-speed rail corridors, four running north-south and four east-west, and has a total of 12,000 km. Most of the lines follow the routes of existing trunk lines and are designated for passenger traffic only. They are known as passenger-designated lines (PDL). Several sections of the national grid, especially along the southeast coastal corridor, were built to link cities that had no previous rail connections. Those sections will carry a mix of passenger and freight. High-speed trains on HSR Corridors can generally reach 300–350 km/h (190–220 mph). On mixed-use HSR lines, passenger train service can attain peak speeds of 200–250 km/h (120–160 mph). This ambitious national grid project was planned to be built by 2020, but the government's stimulus has expedited time-tables considerably for many of the lines. The Shangqiu-Hangzhou HSR, part of the Harbin-Hong Kong (Macau) Passageway, under construction in Shangqiu, Henan Province, in February 2017. The elevated HSR runs next to the conventional speed Beijing–Kowloon Railway. The 4+4 national HSR grid was largely completed by the end of 2015 and now serves as the backbone of China's HSR network. In July 2016, the state planners reorganized the national HSR network—including HSR lines in operation, under construction and under planning—into eight vertical and eight horizontal high speed rail "passageways", almost doubling the network. According to the "Mid-to-Long Term Railway Network Plan" (revised in 2008), the MOR plans to build over 40,000 km (25,000 mi) of railway in order to expand the railway network in western China and to fill gaps in the networks of eastern and central China. Some of these new railways are being built to accommodate speeds of 200–250 km/h (120–160 mph) for both passengers and freight. These are also considered high-speed rail though they are not part of the national HSR grid or Intercity High Speed Rail. Several HSR lines planned and built as a regional high-speed railway under the 2008 Revisions have since been incorporated into the 8+8 national grid. Intercity railways are designed to provide regional high-speed rail service between large cities and metropolitan areas that are generally within the same province. They are built with the approval of the central government but are financed and operated largely by local governments with limited investment and oversight from the China Rail Corporation. Some intercity lines run parallel to other high-speed rail lines but serve more stations along the route. Intercity HSR service speeds range from 200–350 km/h (120–220 mph). Along with the expansion of HSR network, China’s regular speed railway network is also adding or upgrading new lines for mixed passenger and freight traffic. Many of these new regular speed railways that are being built or upgraded to carry high-speed passenger train sets traveling at up to 200 km/h (124 mph). Some of these newly-built regular speed railway lines will form part of the HSR passageways and can be used as regular speed rail sections on longer HSR routes. Passenger tapping China Resident ID Card to board a high-speed train on China Railway High-speed. China Railway High-speed (CRH) (中国铁路高速) is the major high-speed rail service provided by state-owned railway manufacturing and construction corporation China Railway. China Railway is the successor of the former Ministry of Railways. Ministry held the power drafting policy on railroad transposition, development of the rail network and rail infrastructure in China. Nowadays, China Railway no longer decides the railway policy, instead focus on the development of the rail network and rail infrastructure in China. China Railway assumed control of complete railway network that was built by the dissolved Ministry of Railways. The CRH's high-speed trains are called Harmony and Rejuvenation. In October 2010, CRH service more than 1,000 trains per day, with a daily ridership of about 925,000. as of May, 2015, a total of 1469 CRH trainsets were put into use. Other than China Railway, Hong Kong MTR Corporation provides short-haul service on Guangzhou–Shenzhen–Hong Kong Express Rail Link (XRL). China Railway reports the number of passengers carried by high-speed EMU train sets and this figure is frequently reported as high-speed ridership, even though this figure includes passengers from EMU trains providing sub-high speed service. In 2007, CRH EMU trains running on conventional track upgraded in the sixth round of the "Speed-up Campaign" carried 61 million passengers, before the country's first high-speed rail line, the Beijing–Tianjin intercity railway, opened in August 2008. In 2018, China Railway operated 3,970.5 pairs of passenger train service, of which 2,775 pairs were carried by EMU train sets. Of the 3.313 billion passenger-trips delivered by China Railway in 2018, EMU train sets carried 2.001 billion passenger-trips. This EMU passenger figure includes ridership from certain D- and C-class trains that are technically not within the definition of high-speed rail in China, as well as ridership from EMU train sets serving routes on conventional track or routes that combine high-speed track and conventional track. Nevertheless, by any measure, high-speed rail ridership in China has grown rapidly with expansion of the high-speed rail network and EMU service since 2008. China is the third country, after Japan and France, to have one billion cumulative HSR passengers. In 2018, annual ridership on EMU train sets, which encompasses officially defined high-speed rail service as well as certain sub-high-speed service routes, accounted for about two-thirds of all regional rail trips (not including urban trains) in China. At the end of 2018, cumulative passengers delivered by EMU trains is reported to be over 9 billion. Business class compartment inside a CRH380BL train. Buffet car inside CRH1 train. Sleeping compartment inside CRH2E train. China Railway High-speed runs different electric multiple unit trainsets, the name Hexie Hao (simplified Chinese: 和谐号; traditional Chinese: 和諧號; pinyin: Héxié Hào; literally: 'Harmony') is for designs which are imported from other nations and designated CRH-1 through CRH-5 and CRH380A(L), CRH380B(L), and CRH380C(L). CRH trainsets are intended to provide fast and convenient travel between cities. Some of the Hexie Hao train sets are manufactured locally through technology transfer, a key requirement for China. The signalling, track and support structures, control software, and station design are developed domestically with foreign elements as well. By 2010, the truck system as a whole is predominantly Chinese. China currently holds many new patents related to the internal components of these trains, re-designed in China to allow the trains to run at higher speeds than the foreign designs allowed. However, these patents are only valid within China, and as such hold no international power. The weakness on intellectual property of Hexie Hao causes obstruction for China to export its high-speed rail related product, which leads to the development of the completely redesigned train franchise called Fuxing Hao (simplified Chinese: 复兴号; traditional Chinese: 復興號; pinyin: Fùxīng Hào; literally: 'Rejuvenation') that based on indigenous technologies. Russian President Dmitry Medvedev aboard a high-speed train in Hainan in April 2011. Many of the Passenger Designated Lines use ballastless tracks, which allow for smoother train rides at high speeds and can withstand heavy use without warping. The ballastless track technology, imported from Germany, carries higher upfront costs but can reduce maintenance costs. Chinese train-makers and rail builders have signed agreements to build HSRs in Turkey, Venezuela and Argentina and are bidding on HSR projects in the United States, Russia, Saudi Arabia, Brazil (São Paulo to Rio de Janeiro) and Myanmar, and other countries. They are competing directly with the established European and Japanese manufacturers, and sometimes partnering with them. In Saudi Arabia's Haramain High Speed Rail Project, Alstom partnered with China Railway Construction Corp. to win the contract to build phase I of the Mecca to Medina HSR line, and Siemens has joined CSR to bid on phase II. China is also competing with Japan, Germany, South Korea, Spain, France and Italy to bid for California's high-speed rail line project, which would connect San Francisco and Los Angeles. In November 2009, the MOR signed preliminary agreements with the state's high-speed rail authority and General Electric (GE) under which China would license technology, provide financing and furnish up to 20 percent of the parts with the remaining sourced from American suppliers, and final assembly of the rolling stock in the United States. In January 2014, the China Railway Construction Corporation completed a 30-km section of the Ankara-Istanbul high-speed railway between Eskişehir and İnönü in western Turkey. In mid 2015, China has signed up to design a high-speed railway between the Russian cities of Moscow and Kazan, one of the first concrete examples of the new business with China that Russian officials have been pursuing with renewed vigor since falling out with the West. A unit of Russia’s state-owned JSC Russian Railways signed a contract Thursday with the design unit of China’s state-controlled China Railway Group to come up with the plans for a 770 kilometer high-speed rail between the two Russian cities. The Chinese firm will work alongside two Russian companies for on the designs for a total cost of 20.8 billion rubles ($383 million) over the next two years, according to Russian Railways. Once the designs are developed, a separate tender will be held for the actual construction of the rail link, which Russian Railways expects to cost 1.06 trillion rubles ($19.5 billion). Almost all HSR trains, track and service are owned and operated by the China Railway Corporation under the brand China Railway High-speed with the two exception being the Shanghai Maglev Train which operated by Shentong Metro Group and Guangzhou–Shenzhen–Hong Kong Express Rail Link (XRL), which Hong Kong MTR Corporation operates short-haul train on it. Although both classified as high-speed rail, the Shanghai Maglev often isn't counted as part of the national high-speed rail network, while XRL is fully integrated into the national network of China Railway High-speed. China has the world's only commercial maglev high-speed train line in operation: The Shanghai Maglev Train, a turnkey Transrapid maglev demonstration line 30.5 km long. The trains have a top operational speed of 430 km/h and can reach a top non-commercial speed of 501 km/h. It opened for operations in March 2004, and transports passengers between Shanghai's Longyang Road station and Shanghai Pudong International Airport. There have been numerous attempts to extend the line without success. A Shanghai-Hangzhou maglev line was also initially discussed but later shelved in favour of conventional high-speed rail. Two other Maglev lines, the Changsha Maglev and the Line S1 of Beijing, were designed for commercial operations with speeds lower than 120 km/h. In October 2016 China's CRRC Corp announce it was beginning research and development on a 600 km/h maglev train and would build a 5 km test track. Reports state a sample carriage will be built in 2018 and the test track completed by 2020. The Shanghai Maglev train, with a top speed of 431 km/h (268 mph), is the fastest train in China. The maglev train has remained confined to its original 30 km (19 mi) track as state planners chose high-speed trains that run on conventional tracks for the national HSR network. The "fastest" train commercial service can be defined alternatively by a train's top speed or average trip speed. The fastest commercial train service measured by peak operational speed is the Shanghai Maglev Train which can reach 431 km/h (268 mph). Due to the limited length of the Shanghai Maglev track (30 km)(18.6 mi), the maglev train's average trip speed is only 245.5 km/h (152.5 mph). 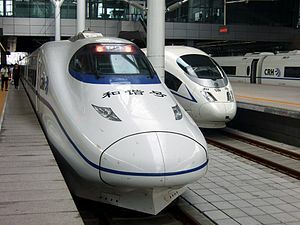 The fastest commercial train service measured by average train speed is the CRH express service on the Beijing–Shanghai high-speed railway, which reach a top speed of 350 km/h (220 mph) and complete the 1,302 km (809 mi) journey between Shanghai Hongqiao and Beijing South, with two stops, in 4 hours and 24 min for an average speed of 291.9 km/h (181.4 mph), the fastest train service measured by average trip speed in the world. The top speed attained by a non-maglev train in China is 487.3 km/h (302.8 mph) by a CRH380BL train on the Beijing–Shanghai high-speed railway during a testing run on January 10, 2011. The G403/404, and G405/406 Beijing West (Beijingxi)-Kunming South (Kunmingnan) train (2760 km, about 12–13 hours), which began service on January 1, 2017, became the longest high-speed rail service in the world. It overtook the G529/530 Beijing West-Beihai train (2697 km, 15 1/2 hours for southbound train, 15 3/4 hours for northbound train), which had set the previous record on July 1, 2016. ^ According to Xinhua News Agency, the aggregate results of the six “Speed Up Campaigns” were: boosting passenger train speed on 22,000 km (14,000 mi) of tracks to 120 km/h (75 mph), on 14,000 km (8,700 mi) of tracks to 160 km/h (99 mph), on 2,876 km (1,787 mi) of tracks to 200 km/h (124 mph) and on 846 km (526 mi) of tracks to 250 km/h (155 mph). According to China Daily, however, there were 6,003 km (3,730 mi) of tracks capable of 200 km/h (124 mph) in April 2007. ^ "I rode China's superfast bullet train that could go from New York to Chicago in 4.5 hours — and it shows how far behind the US really is". Business Insider. Insider Inc. 2018-10-27. Retrieved 2018-10-27. ^ 马玉佳. "New high-speed trains on drawing board- China.org.cn". www.china.org.cn. Retrieved 2017-11-13. ^ chinanews. "2017年中国铁路投资8010亿元 投产新线3038公里-中新网". www.chinanews.com. Retrieved 2018-01-13. ^ a b c "Ten years, 27,000km: China celebrates a decade of high-speed". International Railway Journal. August 2, 2018. ^ a b c "China acts on high-speed rail safety fears". Financial Times. 2011-04-14. Retrieved 2011-08-17. ^ a b c Ministry of Railways 2013, Art. 5. ^ See ridership section for further details. ^ a b Louise Young. Japan's Total Empire. Berkeley: University of California Press 1998. pp.246-7. ^ "(Chinese)". News.cctv.com. Retrieved 2011-08-14. ^ 中国高铁"十一五"发展纪实：驶向未来 (in Chinese). Xinhua News Agency. 2010-09-25. Archived from the original on 2015-01-13. Retrieved 2015-05-09. ^ MacLeod, Calum (June 1, 2011). "China slows its runaway high-speed rail expansion". USA Today. Retrieved 2011-08-14. ^ "Rail track beats Maglev in Beijing–Shanghai High Speed Railway". People's Daily. 2004-01-18. Retrieved 2011-10-17. ^ "Beijing–Shanghai High-Speed Line, China". Railway-technology.com. 2011-06-15. Retrieved 2011-10-17. ^ "Japan Inc Shoots Itself on the Foot". Financial Times. 2010-07-08. Retrieved 2011-08-14. ^ "Era of "Created in China"". Chinapictorial.com.cn. Retrieved 2011-08-14. ^ "China: A future on track". Xinkaishi.typepad.com. 2010-10-05. Retrieved 2011-08-14. ^ 汪玮 (2011-07-08). "China denies Japan's rail patent-infringement claims. On 2011-07-24. Retrieved 2011-07-25". China.org.cn. Retrieved 2011-08-14. ^ "First Chinese designed HS train breaks cover:". International Railway Journal. September 2010. ^ "China's 'Super-Speed' Train Hits 500km". 2010-10-20. Archived from the original on 2013-10-29. Retrieved 2010-11-03. ^ a b c d Bradsher, Keith (2010-02-12). "Keith Bradsher, "China Sees Growth Engine in a Web of Fast Trains"". China; United States: Nytimes.com. Retrieved 2011-08-17. ^ a b c Forsythe, Michael (2009-12-22). "Michael Forsythe "Letter from China: Is China's Economy Speeding Off the Rails?"". China: Nytimes.com. Retrieved 2011-08-17. ^ xinhuanet (2011-02-04). "High-speed rail broadens range of options for China's New Year travel". Retrieved 2011-02-04. ^ "2011年中国铁路将投资7000亿元_公司频道_财新网". Business.caing.com. 2011-01-05. Retrieved 2011-10-17. ^ a b c "Off the rails?". The Economist. 2011-03-31. ^ "China finds 187 mln yuan embezzled from Beijing-Shanghai railway project". News.xinhuanet.com. 2011-03-23. Retrieved 2011-08-14. ^ Moore, Malcolm (2011-08-01). "Chinese rail crash scandal: 'official steals $2.8 billion'". The Telegraph. Retrieved 2012-04-27. ^ "World's longest high-speed train to decelerate a bit". People's Daily Online. 2011-04-15. ^ "Beijing-Shanghai high-speed railway to run trials". News.xinhuanet.com. 2011-05-11. Retrieved 2011-08-14. ^ "Train speed claims were false". ^ "Railway cuts bullet trains from schedule | Sunday Digest". China Daily. 2011-07-23. Retrieved 2011-08-14. ^ Johnson, Ian (2011-07-24). "Train Wreck in China Heightens Unease on Safety Standards". The New York Times. ^ a b Watt, Louise (2011-07-25). "Crash raises doubts about China's fast rail plans". Washington Times. Retrieved 2011-10-17. ^ Tania Branigan in Beijing and agencies (2011-08-12). "Chinese bullet trains recalled in wake of fatal crash | World news". The Guardian. UK. Retrieved 2011-10-17. ^ Lafraniere, Sharon (2011-07-28). "Five Days Later, Chinese Concede Design Flaw Had Role in Wreck". The New York Times. ^ Reinoso, Jose (2011-07-29). "Un error en las señales causó el choque de trenes chinos". El País Archivo (in Spanish). Retrieved 2015-10-17. ^ "La signalisation mise en cause dans l'accident du Pékin-Shanghaď". Le Monde (in French). France. Retrieved 2011-10-17. ^ "La sécurité des TGV chinois de plus en plus contestée". Le Monde (in French). France. Retrieved 2011-10-17. ^ Martin Patience (2011-07-28). "BBC News - China train crash: Signal design flaw blamed". Bbc.co.uk. Retrieved 2011-08-17. ^ Cherry Wilson (2011-07-23). "China train crash kills 32 The Observer". Guardian. UK. Retrieved 2011-08-14. ^ Martin Patience (2011-07-28). "China train crash: Signal design flaw blamed". BBC. Retrieved 2011-08-14. ^ Coonan, Clifford (2011-08-12). "Outrage at Wenzhou disaster pushes China to suspend bullet train project". London: The Independent. Retrieved 2011-08-17. ^ "China's High-Speed Rail Accident 'Struck a Nerve' | The Rundown News Blog | PBS NewsHour". PBS. 2011-08-10. Retrieved 2011-08-17. ^ Pilling, David (2011-08-03). "China crashes into a middle class revolt". FT.com. Retrieved 2011-08-17. ^ Reuters in Beijing (2011-08-10). "China steps up train safety amid anger after crash | World news | guardian.co.uk". The Guardian. UK. Retrieved 2011-10-17. ^ "China freezes new railway projects after high-speed train crash". Reuters. 2011-08-10. Retrieved 2011-10-17. ^ "China train crash: Design flaws to blame - safety chief". BBC. 2011-08-12. Retrieved 2011-08-17. ^ Rabinovitch, Simon (2011-08-11). "China suspends new high speed rail plans". FT.com. Retrieved 2011-08-17. ^ "China freezes new railway projects after high-speed train crash". Reuters. 2011-08-10. Retrieved 2011-08-17. ^ "CapitalVue News: China Cuts Ticket Price Of High Speed Rail". Capitalvue.com. 2011-08-12. Archived from the original on 2012-03-23. Retrieved 2011-08-17. ^ a b c d Rabinovitch, Simon (2011-10-27). "China's high-speed rail plans falter". China: Financial Times. Retrieved 2011-10-27. ^ a b "China's high speed rail projects on hold due to cash crunch". Economic Times. 2011-10-27. Retrieved 2011-10-27. ^ a b c "铁路2014年投资8088亿元 超额完成全年计划". 人民网. 2015-01-30. Retrieved 2015-01-30. ^ Fischer, Elizabeth (2012-11-21). "China's high-speed rail revolution". Railway-technology.com. Retrieved 2013-05-04. ^ Shasha, Deng (2012-12-26). "World's longest high-speed rail line makes debut". Xinhua. Retrieved 2013-05-04. ^ "China High Speed Train Development and Investment". The China Perspective. 2012-12-27. Archived from the original on 2013-05-13. Retrieved 2015-10-17. ^ a b "Sound financials recharge China's fast trains". marketwatch.com. 2012-09-10. Retrieved 2013-02-03. ^ a b c "Bullet trains trigger profit growth for railways". The Irish Times. 2012-09-25. Retrieved 2013-02-03. ^ a b "China's high-speed rail still reporting staggering losses". chinawatch.com. 2013-02-03. Archived from the original on 2013-11-10. Retrieved 2013-02-03. ^ "中国高铁盈利地图：东部线路赚翻 中西部巨亏(图)-新华网". news.xinhuanet.com. Retrieved 2016-08-08. ^ Staff, WSJ. "China's Busiest High-Speed Rail Line Makes a Fast Buck". Retrieved 2016-08-08. ^ "十年内高铁运营里程将翻倍 贯通特大城市可采用时速350公里标准 | 每经网". www.nbd.com.cn. Retrieved 2016-10-13. ^ "高铁刷新百姓出行选择". jtyss.ndrc.gov.cn (in Chinese). Retrieved 2018-05-07. ^ "国务院处理温州动车追尾事故54名责任人_新闻中心_新浪网". news.sina.com.cn. Retrieved 2018-05-07. ^ 338. "高铁工程师为何一辈子不坐高铁--科技--人民网". scitech.people.com.cn. Retrieved 2018-05-07. ^ Bradsher, Keith (2013-09-23). "Despite a Deadly Crash, Rail System Has Good Safety Record". The New York Times. ISSN 0362-4331. Retrieved 2018-05-07. ^ a b Bradsher, Keith (2011-07-26). "Road Safety Problems Pose Dire Threat in China". The New York Times. ISSN 0362-4331. Retrieved 2018-05-07. ^ Thompson, Bente, Louis, Heiner (November 2014). "What is rail efficiency and how can it be changed?" (PDF). International Transport Forum – via Econstor. ^ "RAILISA STAT UIC". uic-stats.uic.org. Retrieved 2019-01-06. ^ "国家安监总局公布温州动车事故调查报告(全文)-搜狐新闻". news.sohu.com. Retrieved 2018-05-07. ^ "高铁盈利地图：东部赚翻 中西部普遍巨亏". finance.sina.com.cn. Retrieved 2018-05-07. ^ a b c d Freeman, Will (2010-06-02). "Freeman & Kroeber, "Opinion: China's Fast Track to Development"". Wall Street Journal. Retrieved 2011-08-17. ^ a b Bradsher, Keith (2009-01-22). "Keith Bradsher, "China's Route Forward"". China: Nytimes.com. Retrieved 2011-08-17. ^ "Shanghai, Shenzhen, Beijing Lead Prospects in ULI's China Cities Survey - Urban Land Magazine". Urban Land Magazine. 2016-10-03. Retrieved 2017-03-13. ^ "China's high-speed-rail network and the development of second-tier cities". JournalistsResource.org, retrieved Feb. 20, 2014. ^ "Japan Inc shoots itself in foot on bullet train". Ft.com. 2010-07-08. Retrieved 2011-08-17. ^ 我国首条快速客运专线"秦沈客运专线"开通. news.sina.com.cn (in Chinese). 2003-10-12. ^ 合宁铁路今天通车运营. ah.people.com.cn (in Chinese). 2008-04-18. Archived from the original on 2011-07-18. ^ "胶济铁路客运专线施工进入决战阶段". Archived from the original on 2011-07-26. ^ "甬台温铁路客运专线8月1日开通". Archived from the original on 2011-07-08. ^ "福厦高铁正式开通运营 打造绿色环保"快车道"". Archived from the original on 2011-07-20. ^ "东北首条城际高速铁路开通 总投资达96亿(组图)". Archived from the original on 2011-01-14. ^ "东环铁今开通 本报今推《东环铁乘车指南》". Archived from the original on 2011-07-11. ^ "京沪高铁开通首日上座率达98%". Archived from the original on 2011-07-04. ^ a b Bradsher, Keith (2013-09-24). "Speedy Trains Transform China". New York Times. Retrieved 2013-09-26. ^ "Is Low-Cost Intercity Rail Possible? | Pedestrian Observations". Pedestrianobservations.wordpress.com. Retrieved 2016-06-03. ^ National Development and Reform Commission 2016, pp. 7-10. ^ "30,000-kilometer high-speed railway to cover 80% of urban areas by 2020". People's Daily Online. July 21, 2016. ^ National Development and Reform Commission 2016, pp. 8-9. ^ National Development and Reform Commission 2016, pp. 9-10. ^ Ministry of Railways 2013, Art. 8. ^ National Development and Reform Commission 2008, pp. 2-5. ^ National Development and Reform Commission 2016, pp. 11-16. ^ "把脉中国高铁发展计划：高铁运行头三年" (PDF). worldbank.org. 2012-02-01. ^ "中国高速铁路: 运量分析" (PDF) (in Chinese). World Bank. December 2014. Archived from the original (PDF) on 2014-12-21. Retrieved 2015-10-17. ^ "铁路2014年投资8088亿元 超额完成全年计划-财经-人民网". 人民网 - people.com.cn (in Chinese). 2015-01-30. Retrieved 2015-10-17. ^ "China Railway sets out 2017 targets - International Railway Journal". 4 January 2017. ^ "China Exclusive: Five bln trips made on China's bullet trains". 新华网英文版. 2016-07-21. ^ chinanews. "2017年中国铁路投资8010亿元 投产新线3038公里-中新网". www.chinanews.com. ^ a b "中国铁路2018年成绩：旅客发送量33.7亿人次 货物发送量40.22亿吨". 央视财经. Retrieved 2019-01-30. ^ a b c d e f "中国高铁动车组发送旅客90亿人次：2018年占比超60％". 太平洋电脑网. Retrieved 2019-01-30. ^ a b Shirouzu, Norihiko (2010-11-17). "Train Makers Rail Against China's High-Speed Designs". The Wall Street Journal. Retrieved 2012-12-26. ^ Wines, Michael; Bradsher, Keith (2011-02-17). "China Rail Chief's Firing Hints at Trouble". The New York Times. Retrieved 2012-12-27. Many multinational companies also resent China for tweaking foreign designs and building the equipment itself rather than importing it. ^ Johnson, Ian (2011-06-13). "High-Speed Trains in China to Run Slower, Ministry Says". The New York Times. Retrieved 2012-12-27. In the past few months, some foreign companies that sold China its high-speed technology said the trains were not designed to operate at 215 miles per hour. The ministry said that Chinese engineers had improved on the foreign technology and that the trains were safe at the higher speeds. ^ Xin, Dingding (2011-06-28). "Full steam ahead for high-speed rail patents overseas". China Daily. Retrieved 2012-12-27. ^ "GC Ticker June–July 2009". Google. Retrieved 2011-08-14. ^ "WuGuang High Speed Rail Project". Docstoc.com. 2010-02-05. Retrieved 2011-08-14. ^ Keith Bradsher (2010-04-08). "China Is Eager to Bring High-Speed Rail Expertise to the U.S." The New York Times. Retrieved 2010-04-08. ^ "GE and China MOR Sign Strategic MOU to Advance High-Speed Rail Opportunities in the U.S." 3blmedia.com. 2009-11-17. Retrieved 2011-08-17. ^ Sonne, Paul (2015-06-19). "China to Design New Russian High-Speed Railway". WSJ. Retrieved 2016-06-03. ^ "No timetable yet for Shanghai-Hangzhou maglev line: official". Xinhua News Agency. 2010-03-23. Archived from the original on 2010-03-24. Retrieved 2010-03-23. ^ "Beijing's first maglev line resumes construction". China Daily. April 22, 2015. ^ "Chinese firm launches R&D on 600 km/h maglev train". 2016-10-22. Retrieved 2016-12-19. ^ "China to develop high-speed maglev prototype in 2020". Xinhuanet. January 25, 2018. Retrieved 8 February 2018. ^ "京沪高铁明提速 "复兴号"将在中途超车"和谐号"". Retrieved 2018-12-03. ^ "China restores bullet train speed to 350 kph - Xinhua | English.news.cn". www.xinhuanet.com. Retrieved 2018-03-10. ^ "China begins to restore 350 kmh bullet train - Xinhua | English.news.cn". www.xinhuanet.com. Retrieved 2018-03-10. ^ "中国北车刷新高铁运营试验世界纪录速度(图)-搜狐证券". Stock.sohu.com. Archived from the original on 2011-07-20. Retrieved 2011-08-14. Ministry of Railways (2013-01-09). 中华人民共和国铁道部令 第34号 铁路主要技术政策 [Ministry of Railways Order No. 34 Primary Railway Technology Policy] (in Chinese). People's Republic of China Ministry of Railways. Retrieved 2017-07-30. National Development and Reform Commission (October 2008). 中长期铁路网规划(2008年调整) [Mid- to Long-Term Railway Network Plan (2008 Revision)] (PDF) (in Chinese). People's Republic of China National Development and Reform Commission. Retrieved 2017-07-30. National Development and Reform Commission (2016-07-13). 中长期铁路网规划" (2016) 发改基础(2016)1536号 [Mid- to Long-Term Railway Network Plan (2016 Revision)] (PDF) (in Chinese). People's Republic of China National Development and Reform Commission. Retrieved 2017-07-30.